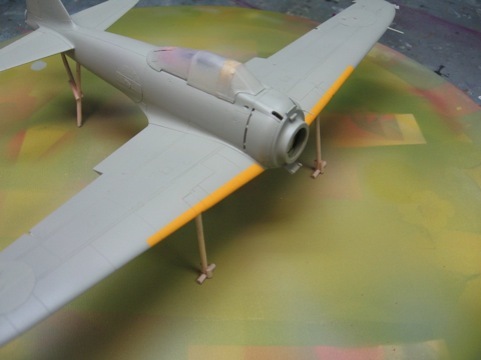 If you model a British or Japanese WW II subject, sooner or later you will be faced with doing those pesky yellow leading edge identification stripes on the wing leading edge. Many kits supply decals for this item and trying to fold the decal around the leading edge and get it all settled down without wrinkles can be an exercise in frustration. For a long time I would laboriously measure off the dimensions and using about 357 small pieces of tape finally arrive at the completed stripe. Well I said to myself - "self there has got to be a better way to do this" and after some thought I have found a better way that really works. 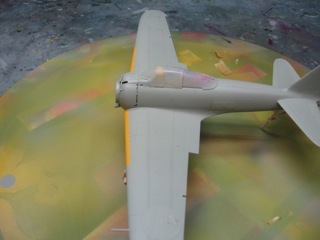 First, spray the leading edge area with yellow paint and allow to dry THOROUGHLY. Take the kit decals for the leading edge stripes and cut the stripe out with a sharp blade removing the entire clear film surround. Now take the still dry decal (!) and lay it on to a piece of Tamiya tape that had been stuck on to a piece of glass. Take a SHARP pencil and carefully outline the decal onto the masking tape, then using a straight edge run a pencil line through the middle of the tape lengthwise. Take a sharp blade and cut the outline of the decal out. Since you traced it, the mask will be somewhat oversized so cut on the INSIDE of the pencil outline. You may want to use a swivel knife for any curves. Now carefully remove the tape from the glass and align the lengthwise pencil line with the apex of the wing leading edge also establishing where the inboard end of the stripe starts on the wing. When the tape is in the correct position for these two areas burnish down the tape with your finger or a round toothpick to get a good seal. 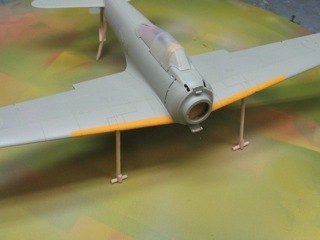 Paint the model with the camouflage colors and let dry. Carefully remove the tape masks and you have a nice sharp leading edge identification band. This method is a lot easier than using up 60% or your near vision half-life trying to put down all those little pieces of tape. Many kits now have these L.E decals, Hasegawa's 1/48 Pete, Tamiya’s 1/48 Zeros and 1/32 Spitfire are a few examples.